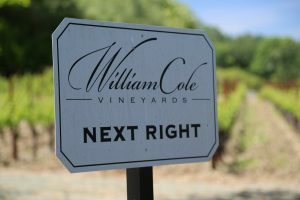 William Cole Vineyards is a premium winery producing 500-700 cases annually from the tiny single 2.5 acre vineyard on site. Even by Napa standards that is small; they are also the smallest producing winery that we know of in Napa Valley to have their own bottling line on site. This has its unique advantages as they are not tied into the schedules of having a mobile bottling truck come to the property. Founders Bill and Jane Ballentine purchased this property in 1999. Bill is the vineyard manager and winemaker; his family has a deeply rooted history in the Napa Valley dating back to 1906 when his great grandfather on his maternal side, Libero Pocai, an immigrant from Lucca, Italy purchased 60 acres of land in the Napa Valley and six years later founded a winery called L. Pocai & Sons Winery and Vineyards. 1906 was also the year of the terrible earthquake in San Francisco – and was the primary reason why he and his wife moved out of the city. Bills grandfather on his paternal side, John Ballentine moved to the Napa Valley in 1922 and in a gusty move (considering this was early prohibition years) purchased 160 acres and a winery in the hills of what is now known as the community of Deer Park. This site was the original home of John Sutter Wine Company (later founded as Sutter Home Winery by the Trinchero Family at their current location in the southern part of St. Helena). Today Bremer Family Winery operates on the old John Sutter Wine Company property. And if you ever wondered how Deer Park got its name (no, it wasn’t named for the deer that used to and still sometimes roam the hillsides), rather John Ballentine named it after his family farm in Ireland. As soon as Prohibition ended, John produced his first wine in 1933, bottled under John J. Ballentine in Sanitarium, California (Sanitarium, named for the nearby hospital was the original name of this community before Deer Park). Bill grew up almost across the highway from William Cole Vineyards – where his family still operates Ballentine Vineyards. He is the 4th generation in his family to make wine in the Napa Valley. Before founding William Cole Vineyards Bill worked for Gallo, his own family (Ballentine Vineyards) and the now closed nearby St. Clement Winery. The name of the winery comes from combining his own name and his son Cole (Cole is 5th generation Napan and is the assistant winemaker). William Cole handcrafts a single vintage Cabernet Sauvignon each year from their estate property called Cabernet Sauvignon Cuvée Claire (named after his daughter). 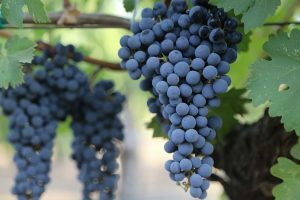 Everyone has their own taste in Cabernet’s and their Cabernet Sauvignon fit our palate like a glove. Our visit here was very early on in our project and after tasting this wine this was the first winery where we said “yes, we get it”! We are always looking for the “it” Cabernet Sauvignon wine during our Napa wine odyssey and this is definitely one of those. A local winemaker we met with previously describes “it” as having that special richness combined with elegance. The 2004 vintage is one of the nicer Cabernet’s that we’ve tried in Napa Valley. It is structured so that nothing dominates the wine, rather the acid, tannins and alcohol are extremely well managed and the overall structure is smooth and velvety. The nose is full of aromas of cherry and touches of vanilla from the French oak which lead to rich fruit flavors with a touch of mocha. Everything contained within this wine is representative of a very high quality Napa Cabernet. 2.5 acres are planted on site and extreme micro management goes into the making of this wine – there are even micro terroir (soil) regions within the small property and each of these regions is treated as its own unit during harvest, fermentation, aging and the actual winemaking. The estate is gorgeous – it is located right next to Highway 29 North and you can drive by their location day in and day out and never know its there due to its hidden location behind the trees and bushes as well as the non signage. 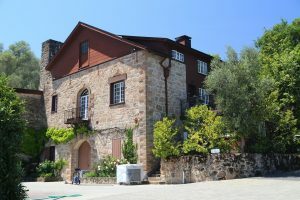 This is one of the first stone wineries built in St. Helena (completed construction in 1873) and originally opened as the JC Weinberger Winery. The Weinbergers purchased the original 240 acre estate from Charles and Carolina Krug in 1868. Starting in 1883 Hannah Weinberger became one of Napa Valley’s first woman winemakers. This was because her husband became a victim of St. Helena’s first murder after a disgruntled employee tricked him with a fake telegram and then shot him in broad daylight at the train platform. In our experience every ghost winery we have visited in the valley has some interesting history. After John’s death, Hannah ran the winery until the start of Prohibition in 1920 when she was forced to close down her production. After Prohibition the property changed hands several times until the Ballentines purchased it. They then spent 5 years restoring both the home and winery (the home sits on top of the winery converted decades ago from its original winery production space). Parts of a prior restoration date from 1938 including the pool – one of the oldest Napa winery pools in the county. The gardens behind the winery were designed by well-known landscape architect Thomas Church who in a career that spanned over 40 years designed hundreds of private gardens and also was the landscape design consultant to Stanford University. The winery and gardens are on the National Register of Historic Places. By 2004 the restorations were complete and the winery was ready for production – over 80 years between vintages. Also of note is William Cole typically places within the top barrel lots at the annual charity Napa Valley Auction. William Cole also owns a 41-acre site high on the slopes of Howell Mountain – planted to 7 acres of vines (the Red Lake Vineyard). Their inaugural release from this vineyard was the 2015 vintage bottled under the Predecessor Estate label. Bill’s son Cole also runs Smoking Gun wines, a Cabernet Sauvignon brand. NOTE: It has been years since we personally visited, toured the property and tasted the wines. This review has been identified as needing a major update.